Striking Chemist Warehouse workers have had a stunning victory, winning large pay rises and permanent jobs for many workers. 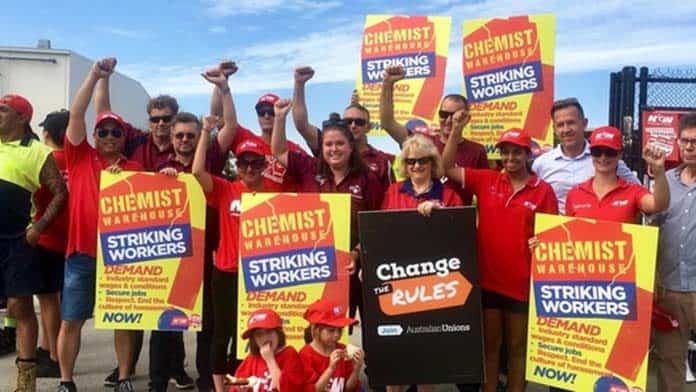 The strike has also strengthened the existing union campaign against sexual harassment and bullying in the Chemist Warehouse Distribution centres. Up to 800 workers stayed out on strike for 16 days at the three Chemist Warehouse distribution centres at Somerton and Preston in Melbourne and Eagle Farm in Brisbane. They have won an immediate 8.75 per cent pay rise, as part of a total pay increase of between 18.75 and 22.5 per cent over four years, and improved redundancy pay. 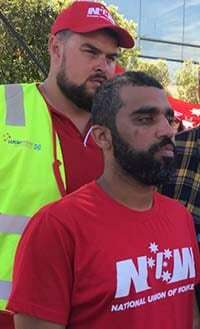 Husain Alqatari, a National Union of Workers (NUW) delegate at Chemist Warehouse’s Preston distribution centre in Melbourne, told Solidarity the workers had demanded the, “standard wages in the industry”. Previously they were “paid 25 per cent lower than [across] the industry”, he said. Full-time workers received as little as $24 an hour. The other major issue was, “secure jobs”, Husain said, “because Chemist warehouse, a giant company, is 80 percent casualised. In this shed there’s 50 permanent and around 250 to 350 casuals, some others have 90 full-timers and 400 casuals.” The company had created a toxic culture with casual workers left waiting for text messages to find out if they were working the next day. The strike showed how to fight casualisation, with permanent workers on the picket lines fighting alongside casuals for the rights of their fellow workers employed via labour hire companies. All labour hire workers who joined the strike will now receive permanent jobs, and any labour hire worker employed for six months will be converted to a permanent position. Previously the company had insisted, “labour hire are not our workers and we’re not going to give them secure jobs”, Husain said. The open ended strike and picket lines to prevent stock moving out resulted in shelves at Chemist Warehouse stores across Melbourne running empty, pressuring the company to concede. This is the kind of action that can bring an end to stagnant wage rises and push up pay. “The owner has just bought a big mansion in Toorak worth $16 million and [co-founders Jack Gance and Mario Verrocchi’s] wealth is $1.6 billion combined”, Husain told Solidarity. “You see their stores everywhere, and the company says they’re growing, opening more stores and stores in New Zealand. Workers have also experienced serious problems with sexual harassment. “Management sexually harass casual workers and permanent workers—[saying] for example if you want more shifts, sleep with me”, Husain explained. “The company said it was inappropriate behaviour and forced one manager to resign, but only because union members got together and fought back. The strike has changed the atmosphere at work, and compulsory sexual harassment training for managers is part of the settlement. Workers faced a widespread culture of bullying and intimidation. But sticking together and fighting has won union rights, including paid union meetings, delegate time, and union training in the agreement for the first time. The NUW is now set to take on logistics company DHL, with a planned strike involving 500 workers who earn as little as $23.30 an hour. The NUW’s industrial campaign has highlighted the problems of low pay for warehouse workers. Changing the rules to allow industry wide strike action could beat low pay across the entire sector. Industry wide bargaining is one of the demands of the ACTU’s Change the Rules campaign. Labor has yet to commit to it, but the strike at Chemist Warehouse shows how workers can win.